Working through the Apostles’ Creed, the next topic is a one-liner, or perhaps a two-liner if we consider the reference to the Holy Spirit in the incarnation (Jesus was “conceived by the power of the Holy Spirit”). 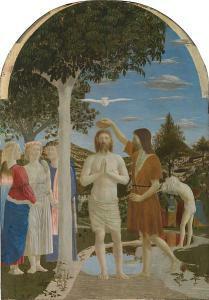 Yet the Holy Spirit is an important part of Christian belief – traditionally represented as a dove as in the image of the baptism of Jesus shown to the right (image credit). Although the understanding of the original audience was somewhat different that Christian understanding, there is a long history of the Holy Spirit or Spirit of God in Scripture. We can start with Genesis 1:1-2 In the beginning God created the heavens and the earth. Now the earth was formless and empty, darkness was over the surface of the deep, and the Spirit of God was hovering over the waters. Derek Vreeland (primal credo), J.I. Packer (Affirming the Apostles’ Creed), Ben Myers (The Apostles’ Creed) and Michael Bird (What Christians ought to Believe) all include this passage in the discussion of the Holy Spirit. The Old Testament references don’t stop here, however. Ps 104:30 When you send your Spirit, they are created, and you renew the face of the ground. Ps 139:7 Where can I go from your Spirit? Where can I flee from your presence? Isaiah 61:1 The Spirit of the Sovereign Lord is on me, because the Lord has anointed me to proclaim good news to the poor. Joel 2:28-29 “And afterward, I will pour out my Spirit on all people. Your sons and daughters will prophesy, your old men will dream dreams, your young men will see visions. Even on my servants, both men and women, I will pour out my Spirit in those days. This is only the tip of the iceberg. Many other references in the Old Testament could be brought forward for discussion. Within the pages of the Old Testament the Spirit is active in creation, in the governance of the world, and in prophetic voice. In the New Testament the two most obvious examples are at the Baptism of Jesus. 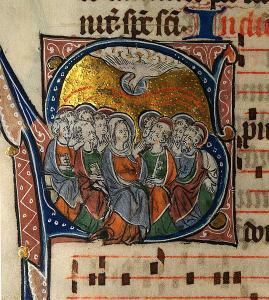 The image to the right is from an illuminated manuscript of liturgies dated to ca. 1315 AD (image credit). Acts 2:1-4 When the day of Pentecost came, they were all together in one place. Suddenly a sound like the blowing of a violent wind came from heaven and filled the whole house where they were sitting. They saw what seemed to be tongues of fire that separated and came to rest on each of them. All of them were filled with the Holy Spirit and began to speak in other tongues as the Spirit enabled them. Other references in the New Testament are to numerous to list. We can look at only a few. The Holy Spirit is sent as a helper and teacher. The Spirit bears witness to Christ. 1 John 5:6 This is the one who came by water and blood—Jesus Christ. He did not come by water only, but by water and blood. And it is the Spirit who testifies, because the Spirit is the truth. The Spirit produces growth in the people of God. 2 Cor. 3 and Gal. 5 are important examples here. 2 Cor. 3:3,18 You show that you are a letter from Christ, the result of our ministry, written not with ink but with the Spirit of the living God, not on tablets of stone but on tablets of human hearts. … And we all, who with unveiled faces contemplate the Lord’s glory, are being transformed into his image with ever-increasing glory, which comes from the Lord, who is the Spirit. Gal. 5: 5, 22-23,25 For through the Spirit we eagerly await by faith the righteousness for which we hope…. But the fruit of the Spirit is love, joy, peace, forbearance, kindness, goodness, faithfulness, gentleness and self-control. … Since we live by the Spirit, let us keep in step with the Spirit. Let us not become conceited, provoking and envying each other. Romans 8 is another important passage. For those who are led by the Spirit of God are the children of God. (v. 14) Paul makes reference to the Spirit repeatedly in his letters. 1 Cor. 12:1, 3, 4, 7 Now about the gifts of the Spirit, brothers and sisters, I do not want you to be uninformed. … Therefore I want you to know that no one who is speaking by the Spirit of God says, “Jesus be cursed,” and no one can say, “Jesus is Lord,” except by the Holy Spirit. There are different kinds of gifts, but the same Spirit distributes them. … Now to each one the manifestation of the Spirit is given for the common good. The Holy Spirit is at work in the church today. May the Spirit work in all of us as we seek to follow. You may also comment on And in the Spirit at Jesus Creed. This entry was posted in Apostles' Creed and tagged Ben Myers, Derek Vreeland, J. I. Packer, Michael Bird. Bookmark the permalink.